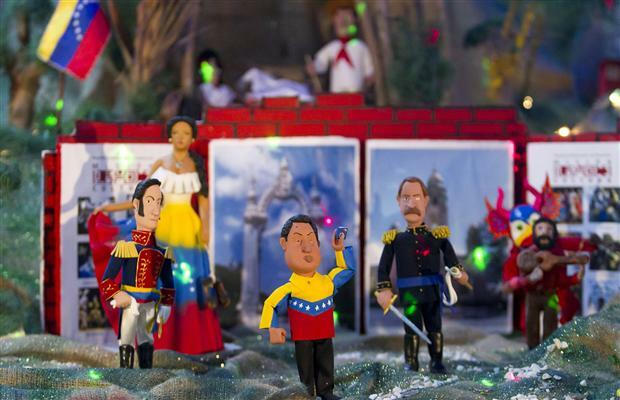 Hugo Chávez, the savior of Venezuela if not the entire world, was prominently featured in a Nativity display in Caracas. Isn’t He just too precious! Where’s the ACLU when you need them? Surely their Caracas office will file a lawsuit demanding that this offensive display be removed! Then Chavez and his generals will be left standing alone…. Hummmmm. Amigos de Chávez Libertad Universal? See, you learn something every day! I didn’t know what ACLU stands for, but now it all makes sense. Alas, according to a painting on display at the “Nazional Guard headquarters of the Andes region (San Cristobal),” el Presidente Chavez is now in Heaven. Read more here. Transitioning from a nativity scene to Heaven in such short order clearly demonstrates the true magnificence of his Holiness, el Thugo. What can he possibly do for an encore?